Too bad this photo is not scratch 'n sniff. The time and consistent training that is required for a half marathon pretty much goes against all that being a Dilettante is. However, the impulsivity of training for a half marathon after not running more than a few miles in three years (Dilettante Kathleen) is pretty much the foundation of the club. This is all Dilettante Amanda's fault. She got into the best running shape of her life this year by giving up beer (I know, it's like we don't even know her any more) for a few months and getting very serious about running. 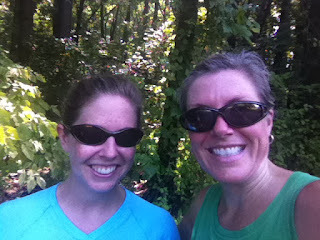 We have all promised an intervention if she goes one more step toward "crazy runner" status. (She already claims to "enjoy" running and has even recently done a run in Chile where she was chased by a wild dog. This has not deterred her.) Her enjoyment of running prompted me to get back into it -- knowing that the only way I would do it is if I had a race to prepare for. Dilettantes Amanda and Kathleen met at the trail at 8:15 and headed off shortly after. There was lots of running, a couple of GU and Chomps breaks, and more running. We finished in a little over two hours and then immediately headed to a 7-11 to disgust all the other customers with our stench get a cold beverage. While not "fun" (for Kathleen anyway -- superfreak Amanda probably found it delightful), we felt like (hot, tired) rock stars after.